THE EAST OREGONIAN — Few people in the 19th century American West could boast the achievements of Peter Burnett. A former reporter and editor, R. Gregory Nokes’ new book, “The Troubled Life of Peter Burnett,” will be available May 15. Published by Oregon State University Press, it chronicles the life of the Oregon pioneer and California’s first governor. He helped organize the first major wagon train to the Oregon Country. He served on Oregon’s first elected government and was Oregon’s first supreme court judge. He opened a wagon road from Oregon to California. He worked with the young John Sutter to develop the new city of Sacramento. Within a year of arriving in California, voters overwhelmingly elected him as the first U.S. governor. He also won appointment to the California Supreme Court. It was one heck of a resume. Yet with the exception of the wagon road to California, in none of these roles was Burnett considered successful or well remembered. Indeed, he resigned from many of his most important positions, including the governorship, where he was widely perceived a failure. Gregory Nokes, a former reporter and editor for The Associated Press and The Oregonian, recently penned a new book chronicling Burnett and his troubles. “The Troubled Life of Peter Burnett” will be available May 15. Published by Oregon State University Press, the 288-page book includes photos and is listed at $19.95. Burnett’s weakness was that he refused to take advice from others. He insisted on marching to his own drum, even when it led to some terrible decisions. A former slaveholder, he could never seem to get beyond his single-minded goal of banning blacks and other minorities from the West. 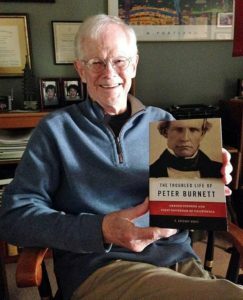 “The Troubled Life of Peter Burnett” is the first full-length biography of this complicated character. Historians, scholars, and general readers with an interest in Western history will want to read Nokes’ in-depth researched account. Nokes also is the author of “Breaking Chains: Slavery on Trial in the Oregon Territory” and “Massacred for Gold: The Chinese in Hells Canyon.” A graduate of Willamette University in Salem, Nokes attended Harvard University as a Nieman Fellow. His reporting on the 1887 murders of more than 30 Chinese gold miners in Hells Canyon resulted in a formal designation of the site as Chinese Massacre Cove and was the basis for an Oregon Public Broadcasting documentary. After retiring from a 40-year journalism career, Nokes embarked on a second career as a historian, lecturer and author. Nokes and his wife, Candise, live in West Linn.